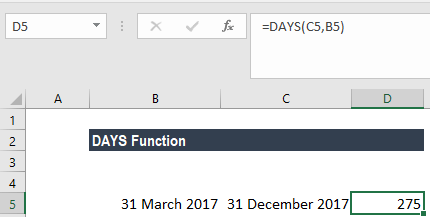 What is the DAYS Function? 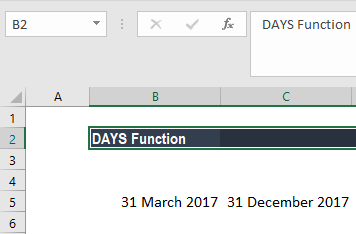 The DAYS function in Excel is a Date/Time functionFunctionsList of the most important Excel functions for financial analysts. 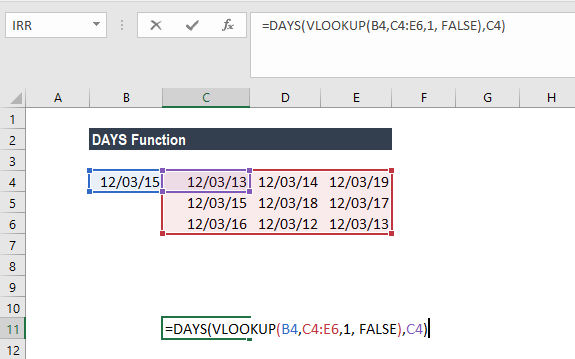 This cheat sheet covers 100s of functions that are critical to know as an Excel analyst that is used for calculating the number of days between two dates. 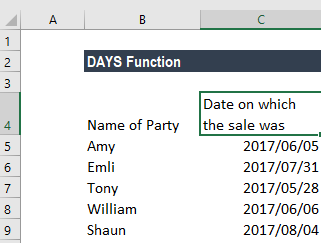 The DAYS function was introduced in MS Excel 2013. 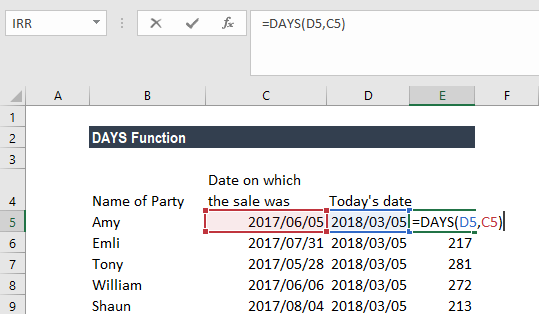 Its purpose is to get the days between two dates provided. Prior to this, we used End date-Start date. The function requires two arguments: Start_date and End_date. They are the two dates between which we wish to calculate the number of days. 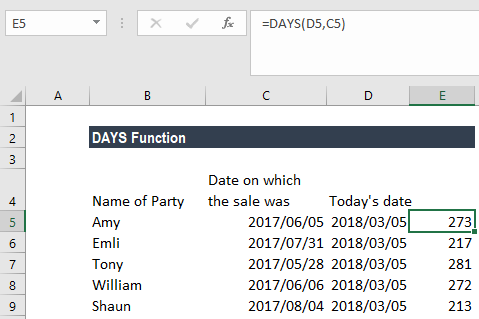 How to use the DAYS Function in Excel? 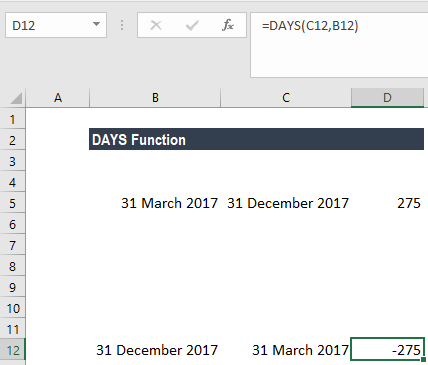 Let’s assume we have entered dates that are not in order, then in that scenario, we can use the DAYS function as follows. Using the data below, when we use DAYS, we would get a negative value. 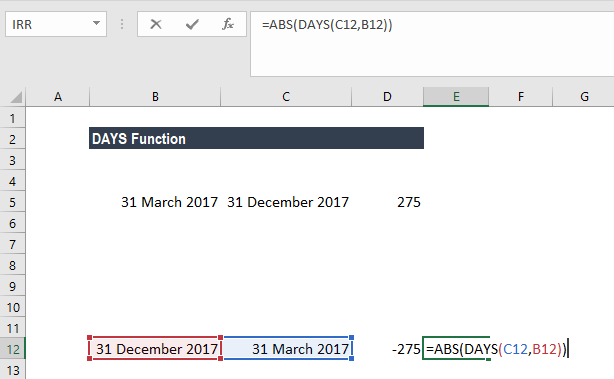 Using the ABS function, the result will always be a positive number regardless of the order in which dates are entered as parameters in the DAYS function. First, we shall use the TODAY function to find out the date as of today. After that, in column D, we will use the DAYS Function and find out how much time has passed since the goods were sold to the customers. Let’s see how the DAYS function works in different scenarios. The function helps to create more complex calculations with dynamic variables. Let’s see how using the data provided below. The above formula would look up for December 3, 2015, in the array of data and then calculate the number of days from December 3, 2013,. 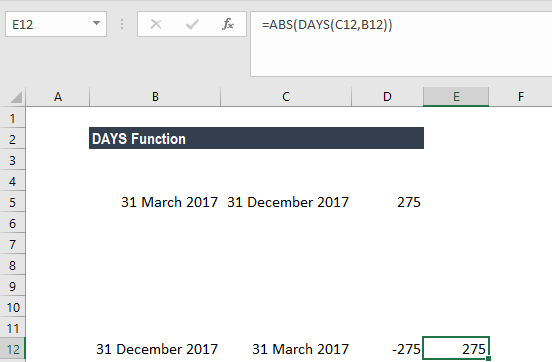 When both arguments are numbers, the DAYS function will use Enddate-Startdate for calculating the number of days between both dates as shown below. When any one of the arguments is text, the argument is treated as DATEVALUE(date_text). In this scenario, it will return an integer date instead of a time component. The #VALUE! 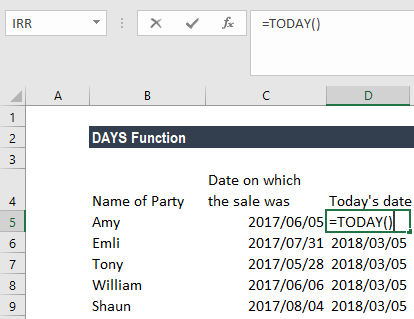 error is returned when one of the date arguments is a string that is not described as a valid date. The #NAME? 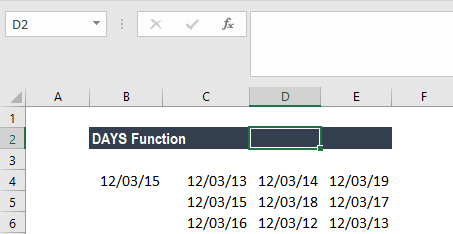 error is returned when the syntax used in the formula is incorrect.